It is always a joy to go back to Collinsport, to drink in the permanent autumnal, twilight atmosphere and enter the lives of the people who live there. I only discovered Dark Shadows last year but have been completely mesmerised by the series - there is something in the atmosphere that makes the stories compelling no matter who the main character is in a particular tale and how little the listener knows about the character because by the end of each tale the listener has suffered with the character and experienced what they have experienced – such is the intimate nature of the Dark Shadows range and this months release, the first of 2017 a collection called “Phantom Melodies” is no different. Phantom Melodies is a collection of four short stories each lasting about 35 minutes and do not deal with ghosts singing the title might suggest, in fact thematically these are very deep stories dealing with temptation, perception, manipulation and loss to t a greater or lesser degree and all have that Dark Shadows atmosphere, that first day of autumn negatively charged feeling of anticipation that permeates the series. Rob Morris is the undisputed King of Dark Shadows and here he has the man himself Matthew Waterhouse narrating his tale as Harry Johnson. In the bar of the Blue Whale Harry, a petty criminal meets a sailor called Mordecai and cannot resist stealing the treasure that Mordecai has in his bag – but Harry gets more than he bargained for as Mordecai is a demon looking for eternal rest and for someone else to take his place in walking death and by succumbing to temptation Harry pretty much fits the bill. Unless he can find someone else suitable to take HIS place. Rob Morris paints a picture in words of a slimy desperate man who will betray anyone to save his own skin, even those he regards as friends, he sees everyone and judges everyone by his own low standards of cunning and deceit. But this being Collinsport, nothing is quite so straightforward and Harry’s choice of victim could be his salvation after all. Andrew Collins narrates this creepy tale of a young bride “Agnes” who has gone to her finance’s home to prepare for her wedding. Agnes has promised to write to her infirm mother every day to let her know how the preparations are going and this she does diligently, and through her letters we find out that all is not well at the house of her fiancée, as Agnes is having dreams of an emaciated man who is scratching at her bedroom window and trying to break in to her room – a man who’s description fits a certain Barnabas Collins….. The year is 1973 and Carolyn Stoddard (Nancy Barrett) receives a strange phone call, strange as the caller claims to be a future version of herself from July 2017. The future Carolyn wants the past Carolyn to avoid making the mistakes to ensure a timeline is preserved, but who exactly is manipulating who and what are the true intentions of future Carolyn? Nancy Barrett gives a stunning performance as both versions of Carolyn Stoddard – both recognisably Carolyn, both subtly different with those experiences that only time can give – a mystery with a resolution that very sharp eared listeners will pick up and solve, and an awful choice for 1973 Carolyn to make that will change the future. A tragic story of missed opportunities and possible futures. Amy Jennings has decided to put the past behind her and take up Elizabeth and Roger’s invitation of a visit to them in Paris, to relax, to see the sites and to reconnect with herself. But when she arrives at their apartment Elizabeth & Roger are not there and Amy is plagued by nightmares of her family and her recent past, and when she meets possible not tall dark & handsome Didier and begins a holiday romance, things start to get a good deal worse. Manipulation really is the theme of this set and no more than in this final story, Amy (Stephanie Ellyne) really is the product of her experiences, everything she does, every person she meets, every incident however innocent is coloured by Collinsport a past she can never escape no matter how hard she tries. An intimate portrait of almost post traumatic stress and how you never can escape yourself no matter where in the world you are, beautifully performed and written with care for the character of Amy, I think this set has saved the best story to last. Four very different on the surface, yet very similar stories tonally and like all good stories stay with the listener. 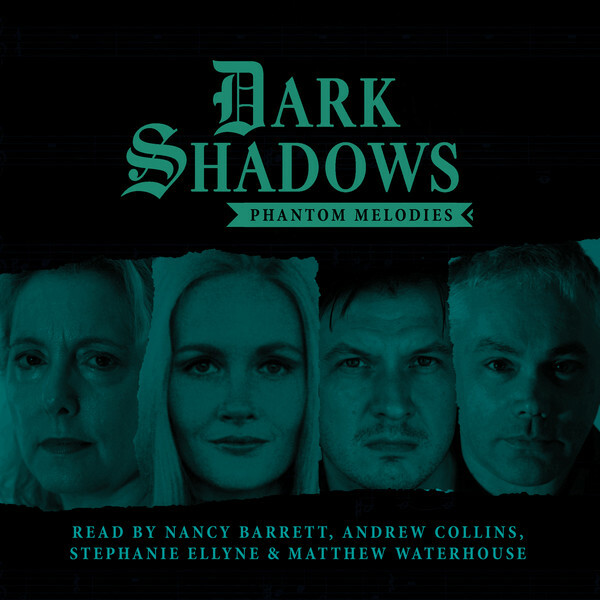 I urge you all to turn the lights down, turn the volume up and lose yourself for a couple of hours in the the wolds of Dark Shadows and experience its Phantom Melodies – 9/10.